Interdisciplinary studies: "are projects that involve several unrelated academic disciplines in a way that forces them to cross subject boundaries to create new knowledge and theory and solve a common research goal. By unrelated, we mean that they have contrasting research paradigms. We might consider the differences between qualitative and quantitative approaches or between analytical and interpretative approaches that bring together disciplines from the humanities and the natural sciences." Transdisciplinary studies: "are projects that both integrate academic researchers from different unrelated disciplines and non-academic participants, such as land managers and the public, to research a common goal and create new knowledge and theory. 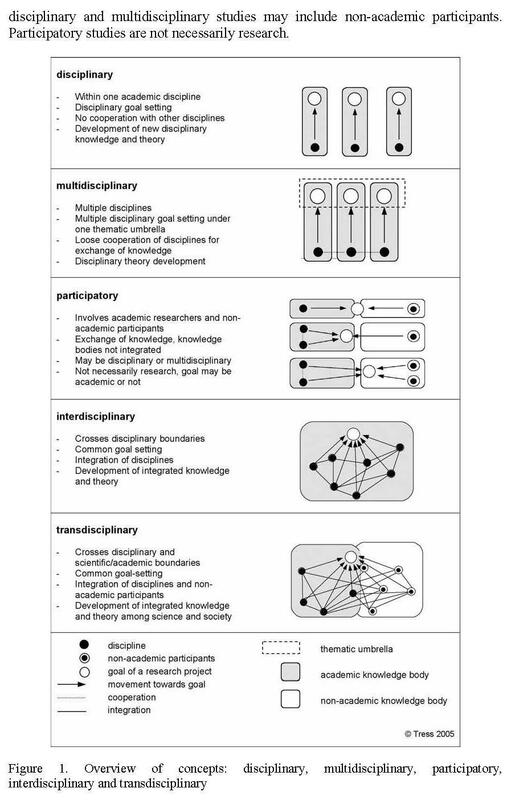 Transdisciplinarity combines interdisciplinarity with a participatory approach." Integrative studies: "are projects that are either interdisciplinary or transdisciplinary, in that new knowledge and theory emerges from the integration of disciplinary knowledge. With the expression integrative research we summarize interdisciplinary and transdisciplinary research efforts." In Figure 1, the characteristics of the proposed definitions of research concepts are illustrated. (Tress, Gunther and Fry, 2006). Tress, Gunther, and Gary Fry. "Defining Concepts and the Process of Knowledge Production in Integrative Research." From Landscape Research to Landscape Planning: Aspects of Integration, Education, and Application. By Bärbel Tress. N.p. : Springer, 2006. 13-26.